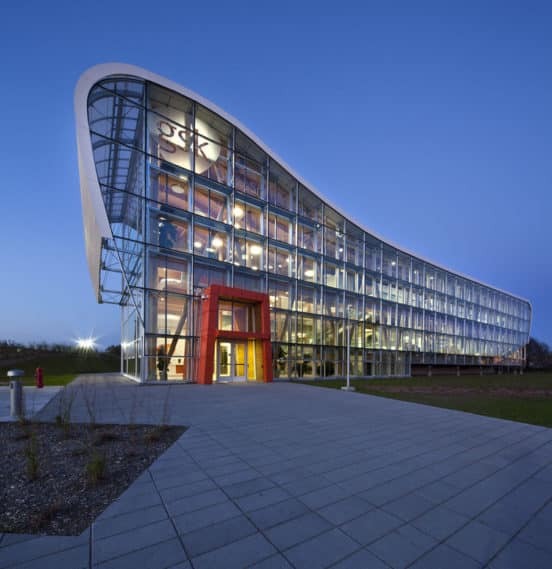 After a contest, the architecture firm coarchitecture won the opportunity to create an administrative building for the pharmaceutical giant. The landscape was barren, so the firm chose to promote biodiversity by restoring the land to its natural state and replenishing it with native plants and groundwater. The building faces south, to protect it from the heat of the sun. 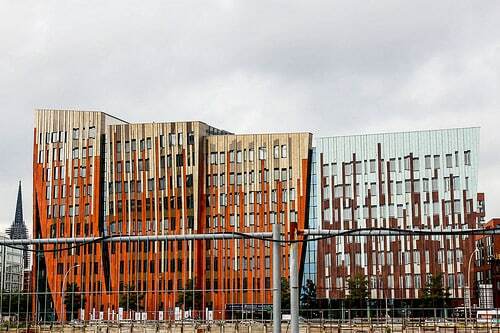 this building is also protected by sun shades that are integrated into the fully-glazed, double-skinned envelope with translucent metal panels on the east and west sides of the building. Conversely, the north side of the building was designed to conserve energy in winter. 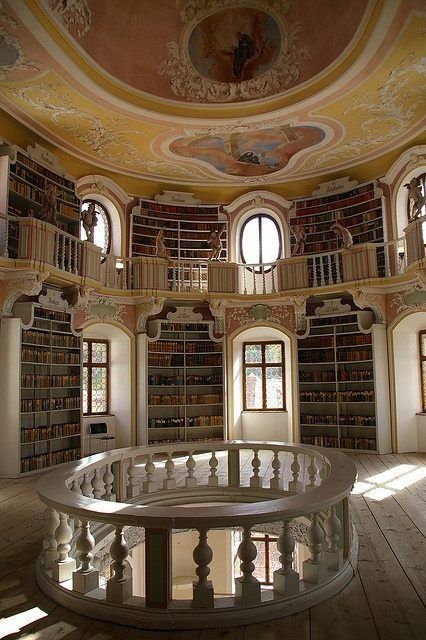 Old library in Füssen, Bavaria, Germany, photo by gerdragon via Flickr. The beautiful Museum of Füssen is located in a former Benedictine Monastery of St. Mang, which was built by architect Johann Jakob Herkomer. The architect used early 18th century Venetian examples and the result is one of the main hallmarks of Füssen’s townscape. The library is one of the building’s most important features. This castle is from the 19th-century and takes its cues from Romanesque Revival. 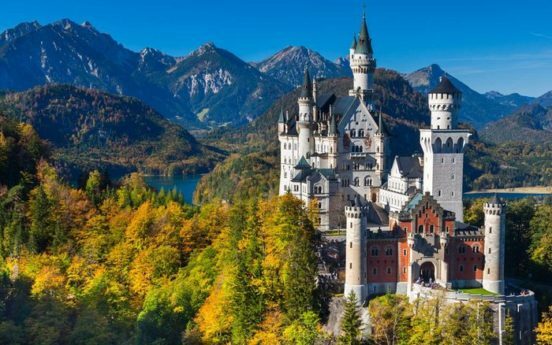 Located on top of a steep hill in southwest Bavaria, the retreat was actually commissioned by Ludwig II as an homage to the great composer Richard Wagner. The castle was for King Ludwig until he died in 1886. It has been open to the public since his death and over 61 million people have visited the castle. It is a popular attraction during the summers, with as many as 6,000 visitors a day and 1.3 annually. The building creates a clear urban block that is built around a courtyard. But one side is open to the main street. This created a semi-public space that can be used by residents and by the public. The building is modern but also contains references to the red-brick harbour buildings. 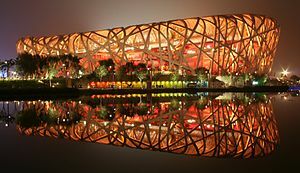 The National Stadium, also known as the Bird’s Nest, was designed by architects Jacques Herzog and Pierre de Meuron of Herzog & de Meuron in Switzerland, project architect Stefan Marbach, renowned artist Ai Weiwei, and CADG which was led by chief architect Li Xinggang. The stadium will look familiar to sports enthusiasts, since it was designed for use throughout the 2008 Summer Olympics and Paralympics and will be used again in the 2022 Winter Olympics and Paralympics. The building cost $428 million, and a shopping mall and hotel are being built on the grounds to increase usefulness between the Olympic games.